I hope you all had amazing weekend full of family, friends and of course – food! Now that Thanksgiving has officially come and gone, I’ve got my baking brain on one thing – holiday cookies. As much as I bake, I realized that I have never participated in a holiday cookie swap. How can that be? I decided this whole lack of cookie exchange situation needed to be fixed – so I enlisted Brittani and we are now in the midst of planning a cookie exchange extravaganza with our coworkers. I even found these adorable and printable invitations on Etsy. Now were are pretty much ready to go, so I am super excited to browse all of your linked recipes to get some ideas for the exchange. As I was pondering a cookie to share with you for the OXO Holiday Recipe Exchange, Rum Balls immediately popped into my head. I honestly have no idea why this was my first thought, because well, a) they aren’t actually a cookie – although they are made with cookies and b) I’ve never eaten a Rum Ball in my life, but I totally went with it and I’m glad I did! 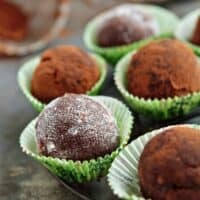 Rum Balls are made with vanilla cookie crumbs, pecans, cocoa, confectioners’ sugar, and spiced rum. Mix everything in a bowl and roll into balls, then you just give them a quick toss in any topping you can think of. Some cocoa, confectioners’ sugar, crushed nuts, sprinkles or whatever else strikes your fancy – any of them are delicious. The best part about this recipe is that they definitely get even tastier if they have some time to hang out the fridge. Easy and delicious – what more can you ask for? I do want to point out that these do taste like spiced rum, so if you aren’t a fan of rum, this isn’t the recipe for you. But rest assured, I’ll have a bunch of cookies posting in the coming weeks. Join Katie and I this week in sharing your recipes for your Favorite Holiday Cookies for a chance to win a great cookie baking utensil gift set from OXO. OXO offers some pretty awesome kitchen gadgets and we know you’ll love the tools in today’s selection. They were selected with the purpose of making your holiday cookie baking a little bit easier. Now, we want to know what your favorite holiday cookie is, so join in on the fun and link up your recipe for a chance to win this fab OXO set! You’ll also definitely want to check out Katie’s recipe for Pistachio Orange Crescent Cookies. 1. In a large bowl, stir together the crushed vanilla wafers, 3/4 cup confectioners' sugar, cocoa, and nuts. Drizzle in vanilla, corn syrup and rum. 2. Scoop scoop and shape into 1 inch balls or larger. I used about 4 teaspoons of the chocolate mixture per ball which equaled 2 level scoops from the small OXO cookie scoop. 3. 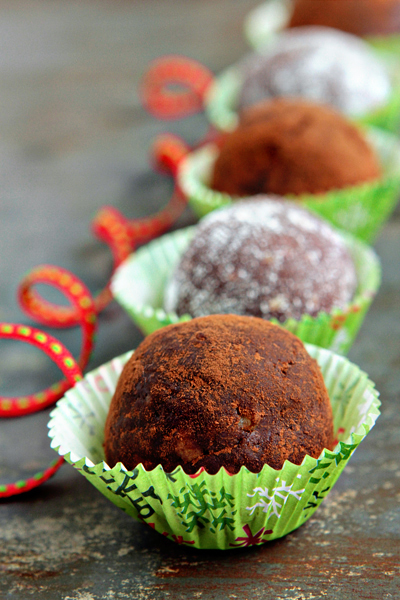 Roll Rum Balls in additional confectioners' sugar, cocoa, sprinkles or whatever strikes your fancy. Store in an airtight container in the refrigerator for several days to develop the flavor. 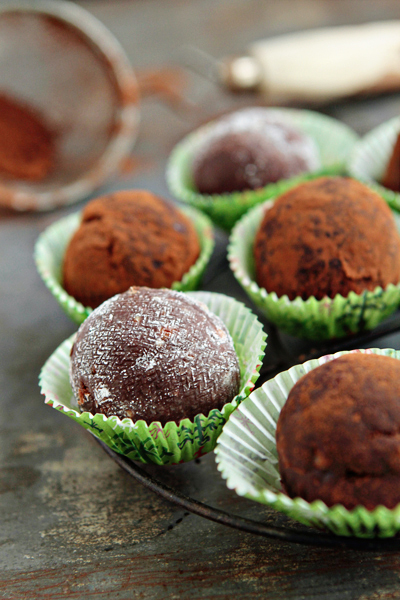 - If you chose to roll your Rum Balls in confectioners; sugar, you may need to recoat them before serving. - I served my Rum Balls in mini cupcake liners that I picked up from Target. Write and post a recipe on your blog featuring YOUR BEST CHRISTMAS COOKIE. Include “Come join the fun at the My Baking Addiction and GoodLife Eats Holiday Recipe Swap sponsored by OXO.” in your blog post. Submit your post before December. 5, 11:59 PM.